Lucy Pet is a family owned, independent company based in Westlake Village, California. 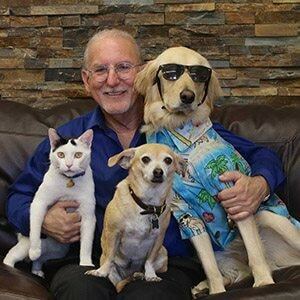 Our President and founder, Joey Herrick also founded The Lucy Pet Foundation, whose mission is to reduce pet overpopulation and the euthanasia of over 80,000 cats and dogs per week in the United States. “Lucy” is the name of a female Chihuahua mix who been out on her own for a long time. She was found completely covered with dirt, toenails curling under, tire marks on her back and malnourished. A few weeks after she was adopted, she gave birth to a litter. Lucy and her pups became the inspiration for The Lucy Pet Foundation. Today Lucy lives with our founder Joey Herrick and his family. Her story also helped inspire our first product line of shampoos. Lucy is featured on the label of our “Berry Berry Smellicious” Shampoo and Leave-In Conditioning Spray, also on the front of our Formulas for Life ™ dog food bag. Everyone at Lucy Pet loves animals. Our pets come to work with us, including Joey’s rescue pets “Surfin’ Jack”, “Ricky the Rescue” cat and his sidekick, “Ethel Moustacha”. At Lucy Pet we strive to make a difference in animals lives by creating products, food, and services for a happy, healthy, and long-lasting life.